Home » news » BBC’s ‘Great British Railway Journeys’ with Michael Portillo visits William Cowley. 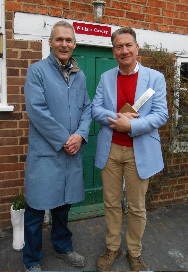 BBC’s ‘Great British Railway Journeys’ with Michael Portillo visits William Cowley. Posted by Adrian on January 15, 2014 in news | Comments Off on BBC’s ‘Great British Railway Journeys’ with Michael Portillo visits William Cowley. You may have seen William Cowley’s recent appearance on Michael Portillo’s ‘Great British Train Journeys’ – Episode 7 -“Bletchley to Newport Pagnell” broadcast on BBC 2 last January. We were very proud to receive Michael Portillo to the William Cowley Parchment and Vellum Works in Newport Pagnell. He visited the works as part of his ”Great British Train Journeys” series with the BBC. Michael was absolutely enthralled by our workshop, and was clearly pleased to see that such a traditional craft, employing ancient skills was still in existence. He was able to see the vellum making process from raw skin to the finished vellum. Under the guidance of our master vellum maker, Lee, Michael went on to test his own skills. Lee commented that Michael was ‘extremely enthusiastic’, and gave it his all. This is praise indeed, as others have tried and fallen at the first hurdle! In our cutting room Michael was able to see the scrolls of Manuscript Vellum used for centuries for recording Acts of Parliament. It is the extremely tough and phenomenally long lasting qualities of the vellum that have made it the material of choice right to the present day. Michael remarked that he had personally seen these vellum scrolls in the parliamentary archives including some signed by King Henry VIII! As a keepsake, Michael was presented with a vellum bookmark for his famous ‘Bradshaws Handbook’ which he has carried throughout each series of his programme. ‘Bradshaws’ is a superb Victorian guide to the British Railways network of the time and the towns the lines served. We had printed Michael’s momento with the image of a steam locomotive from a bygone age, which should serve Michael well for the next 5,000 years!